Playing It Safe in the Peloton? Have you ever wondered what it’s like to ride in the Tour de France? Professor Bert Blocken, who teaches Civil Engineering at the Eindhoven University of Technology in the Netherlands is the guy who can tell you. Over the past two years, Professor Blocken and his team have run the numbers and developed a model that details exactly what it’s like. And while the temptation is to say “it’s just like NASCAR” in that drafting closely behind another competitor benefits both you and the competitor, there’s a better comparison. 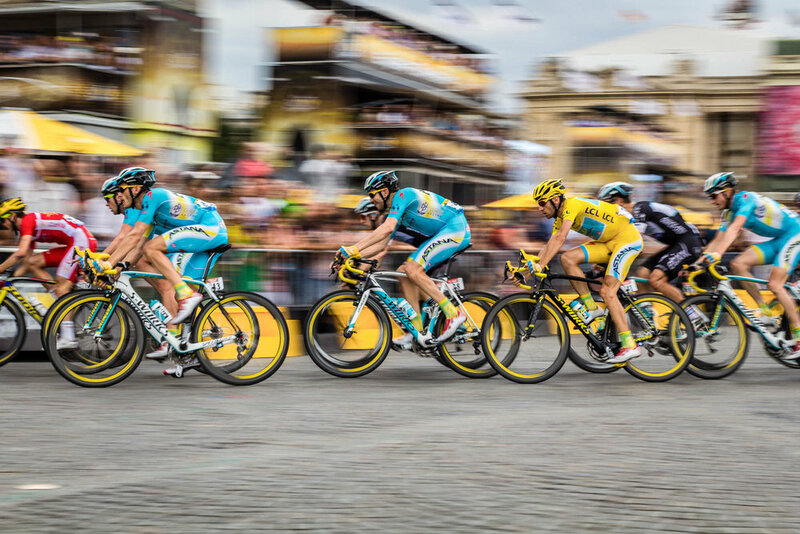 Riding in the Tour de France is exactly like working in most organizations that are struggling to change in the face of potential disruption, globalization, and advancing technology. How so? In both cases, the role of the leader (of the Peloton or the company) is expected to set the direction, speed, and most importantly to accept most of the resistance (aerodynamic or organizational) for the larger group. In both cases, “go along to get along” behaviors are rewarded with a powerful aerodynamic effect sweeping the group forward. And finally, in both cases, those participants who abdicate leadership positions save on energy expended at the expense of playing an active role in where the group is going and how fast it will get there. Dr. Blocken’s work was recently published in the Journal of Wind Engineering and Industrial Aerodynamics and profiled in the Wall Street Journal. And while the conclusion that leading is tough is ont nnew and conserving energy by burrowing yourself in the pack is a core part of a strategy, the extent to which this is true is eye-opening. Per the ground-breaking research, the leader of the Peloton encounters between 75% and 100% of the wind resistance that he would experience if riding alone. In other words, the pack doesn’t benefit the lead rider. For riders further back along the edge or in the Peloton itself, the aero drag drops off quickly, falling as low as 5% for riders near the rear. In other words, riders who choose that subordinate position experience reductions of up to 95% of their aero drag. That’s fine for the Tour, where coasting in the back is typically part of an overall race plan that includes carefully timed sprints to pass or finish strong. It’s another thing when it’s a habitual stance within an organization that desperately needs to change. Behavioral experts frequently cite these disincentives to change, that make it easier to coast on the same, well-worn path, when they discuss an organization’s “immunity to change”. So, how to overcome this resistance, both passive and active? There are three key steps, that work for leaders and encompass the reality of Dr. Blocken’s research. First, realize that while it’s often lonely at the top, leadership isn’t a solitary affair. Leadership done right is personal, so it’s critical to involve multiple levels of leadership, including front-line management, in change initiatives from day one. Second, while the leader needs to know the direction the pack should go, the real power in human organizations originates in broad, grass-roots engagement. No cyclist leads the Tour the entire way. If the broader workforce has a say in the direction of the group, it’s much more likely they’ll get on board and fully engage in driving the organization where it needs to go. Third, if you’re in the pack, recognize the “go along to get along” reality for what it is: inertia. If you’re unhappy with the current direction or speed, it’s up to you to make your voice and ideas heard. Odds are that your unique perspective will help the pack get where it needs to go. Newer PostOne Minute! One Idea! Ep. 11 "Agree on a Vision"
Older PostOne Minute! One Idea! Ep. 10 "Follow Your Heart and Embrace the Inevitable"